A new shortwave broadcast station began operations in February 2002 from the Democratic Republic of the Congo (DRC). Called Radio Okapi, the station is a joint project in the DRC by the United Nations Organization Mission in the Democratic Republic of the Congo (MONUC) and the Fondation Hirondelle, located in Switzerland. This DX Target will focus on the DRC, the Fondation Hirondelle (or Hirondelle Foundation) and, of course, the station, Radio Okapi. The Democratic Republic of the Congo, located in central Africa, is one of the largest countries on the continent. French is the official language. Years of civil war and corruption have badly damaged the country's infrastructure. The DRC shares its borders with Angola, Zambia, Burundi, Sudan, Rwanda, Tanzania, the Central African Republic and the Republic of the Congo. 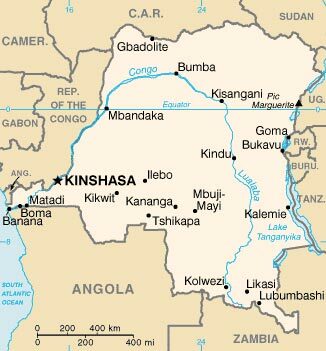 The country's capital city is Kinshasa. Other important cities include Lubumbashi, Mbuji-Mayi and Kisangani. An international port is situated at Matadi on the Zaire River. The DRC has one of the richest reserves of natural resources in the world. Although the country should benefit as a result of this fact, this is not the case. Together with economic mismanagement, the on-going conflict in the country has resulted in the economic decline of the DRC. The war has meant a decrease in national production in all industry sectors. The war in the DRC has claimed over a million lives. The conflict is by no means a clean-cut case of civil war, it is one of a multi-national character involving seven nations. Formerly, the Belgian Congo, this territory was inhabited by ancient Negrito peoples (Pygmies), who were pushed into the mountains by Bantu and Nilotic invaders. The American correspondent Henry M. Stanley navigated the Congo River in 1877 and opened the interior to exploration. Commissioned by King Leopold II of Belgium, Stanley made treaties with native chiefs that enabled the king to obtain personal title to the territory at the Berlin Conference of 1885. Brussels granted freedom to the former colony on 30 June 1960. The Katanga Province seceded from the new republic on July 11 beginning many years of national civil strife. In one form or another unstable governments and revolution since independence have besieged the former Belgian Congo. Since 1997 the Democratic Republic of the Congo, formerly called Zaire, has experienced ethnic strife and civil war, touched off by a massive inflow in 1994 of refugees from the fighting in Rwanda and Burundi. The government of former president Mobutu Sese Seko was toppled by a rebellion led by Laurent Kabila in May 1997. His regime was subsequently challenged by a Rwanda and Uganda-backed rebellion in August 1998. Troops from Zimbabwe, Angola, Namibia, Chad, and Sudan intervened to support the Kinshasa regime. The DRC, Zimbabwe, Angola, Uganda, Namibia, and Rwanda signed a cease-fire on 10 July 1999 with Congolese armed rebel groups. Nevertheless, sporadic fighting has continued. Kabila was assassinated on 16 January 2001 and his son Joseph was named head of state on 26 January 2001. Despite taking a radically different approach than his father, the new president has been equally unsuccessful in ending the war. The Hirondelle Foundation is an organization of journalists, which sets up and operates media services in crisis areas. It is the only organization in the world, which has such specialized experience in this field. As a result of its activities, a number of interesting radio stations appeared around the world. Unfortunately, many of these stations have had very short broadcasting lives. Since its founding in 1995, Hirondelle has established and managed Radio Agatashya in the Great Lakes region of Africa, Star Radio in Liberia, the Hirondelle News Agency at the International Criminal Tribunal for Rwanda at Arusha in Tanzania, Radio Blue Sky in Kosovo, Radio Ndeke Luka in Bangui in the Central African Republic, and Moris Hamutuk, a radio program for refugees in Timor. Its latest venture is Radio Okapi in the Democratic Republic of Congo. The Foundation strongly believes that an independent media has a fundamental role to play in societies where authoritarian and non-democratic regimes are in power. In such situations, the traditional media tend to fall silent because of insecurity and physical risks. The Hirondelle Foundation collaborates in the development of tolerant and democratic societies and contributes to creating a responsible, civic-minded exchange of opinions within the public. The following governments finance the projects of the Hirondelle Foundation: Switzerland, the European Community, the United States, the Netherlands, Sweden, Great Britain, France, Canada, Germany and Japan. International organizations involved include the United Nations High Commissioner for Refugees, United Nations Educational Scientific and Cultural Organization ("UNESCO"), the International Committee of the Red Cross ("ICRC"), the International Foundation for Electoral Systems and the United Nations Development Program ("UNDP"). The Hirondelle Foundation falls under Swiss law. One of the Hirondelle Foundation's cardinal rules is independence from political and economic influences. Independence can guarantee the impartiality of the Foundation's journalistic activities and ensure credibility to its audiences. The Foundation aims to create or support independent media. The staff of the Foundation comes from all nationalities and cultures. The Foundation works to establish an independent media under the most difficult circumstances in authoritarian and non-democratic societies. The Fondation Hirondelle is usually active where conflict is endemic, where there are open hostilities or in post-conflict regions. It is also present in situations where the political, economic or social conditions are not as inviting for an independent media. Obviously, the Democratic Republic of the Congo is well suited for the media and communications expertise the Hirondelle Foundation offers. Radio Okapi is named after a peaceful, four-legged mammal that lives mainly in the Democratic Republic of the Congo, and is a protected species. It has no known enemies. The okapi is well liked by the people of the DRC. Over the years, it has lent its name to various Congolese businesses. No political or military force has tried to appropriate the okapi's name in the past. The MONUC's station is the first such use of the okapi name. Radio Okapi is the largest radio project that the United Nations and the Fondation Hirondelle have ever conducted. It is a radio operation enabling the people of the Congo to communicate with their compatriots. It is a radio station intended to work hand-in-hand with the peace process. Radio Okapi is a network of radio stations designed to cover this immense country of 2.4 million square kilometers, providing services for approximately 45 million inhabitants. The network center is in the capital, Kinshasa. There are six regional studios with plans for four other regional studios to be located in four political and military hotspots. The network is served by satellite, shortwave and FM transmitters and by the Internet. Radio Okapi is a service aimed at a population suffering from years of military conflict and economic stagnation resulting in almost one million refugees and over two million displaced people. Three million people rely on daily food programs while about 300 thousand people are treated for malnutrition. The school attendance rate tumbled to 43% in 1999 from 70% in 1993. Programs are designed to contain non-partisan, credible information broadcast throughout the country. Programs are devoted to themes relating to health, education, human rights, culture and music. The first year's budget is nearly US$2 million. This should be less in succeeding years once the initial start up costs have been made. The operation will be run by around 100 journalists, presenters and staff, the majority of whom will be Congolese. The project involves close co-operation between the United Nations and the Hirondelle Foundation with the aim of making a lasting contribution to peace in the Democratic Republic of the Congo. It also involves co-operation with the existing media in the DRC, mainly with other radios in the fields of production and training. The project is a network of stations designed to continue into the post-MONUC phase. Radio Okapi offers programs, which include news bulletins, magazines and music to everybody in the DRC, whether they are the parties to the conflict or the international community. All broadcasts fall under the authority of the MONUC, the United Nations Observer Mission in the Democratic Republic of the Congo. Radio Okapi broadcasts those programs that are prepared under the supervision of the Hirondelle Foundation. Apart from news, these broadcasts focus on such topics as humanitarian aid with the main goal being the promotion of a peaceful solution to the conflict in the DRC. The programs produced by Radio Okapi are distributed free of charge to local radio under an agreement specifying the terms and conditions of their use and their rebroadcast. Radio Okapi pays particular attention to the situation of the victims of the violence and war, refugees, displaced persons and those who are destitute and especially vulnerable. In its information and magazine programs, Radio Okapi provides specific information on the activities of the United Nations and its specialized agencies, as well as about the MONUC mission, its priorities, the problems it is facing and the peace process. Radio Okapi provides detailed coverage to the process of dialogue among the various political and military groups in the DRC. The programs are produced and broadcast mainly in French, Lingala, Swahili, but also in Chiluba and in other local languages as well as English for members of the international community. Radio Okapi provides local, regional and international news. It produces magazines and interviews done on the spot. The capital, Kinshasa, the headquarters of MONUC, has a central studio coordinating the national program. The shortwave broadcasting system based in Kinshasa covers the entire country. Each regional studio receives the program from Kinshasa and broadcasts it locally. A medium-powered FM transmitter adapted to the local topography provides FM quality reception in its area. The main program is also broadcast via the Internet and the latest news as well as specific programs are available on the Internet. Head of technical services, Georges Schleger, next to Radio Okapi shortwave transmitters in Kinshasa. 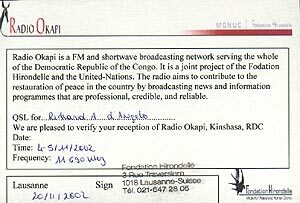 In February 2002, the first morning programs on Radio Okapi commenced on FM in Kinshasa and on shortwave, consisting of one to two hours a day of news broadcasts and magazine features. The station's head of technical services, Georges Schleger, says the station broadcasts on shortwave using 6030 kHz, 9550 kHz and 11690 kHz with a 10-kilowatt transmitter using a Marconi exciter and amplifier. 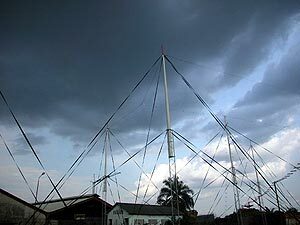 The antenna is a yagi three element pointed to the east 80 degrees from Kinshasa. The 11690 kHz outlet his has competition from Radio Africa International in French from 0600 to 0800 UTC so a listener needs to be careful logging Radio Okapi. Several governments have shown an interest in the Radio Okapi project and have been asked to contribute over the long term to the financing of the operation. Three countries contributed to cover the budget for the first year: Great Britain, Switzerland and the United States.